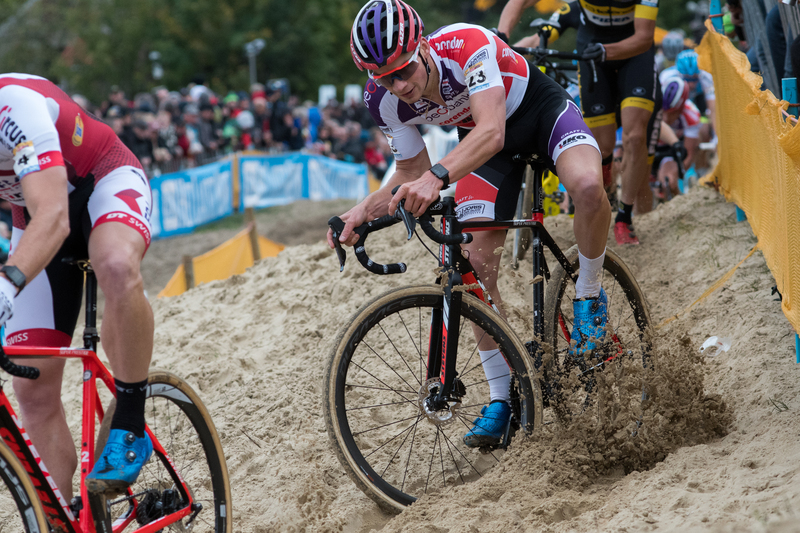 Early in the 2017 CX season, after a series of hot, dry dusty races in the U.S. 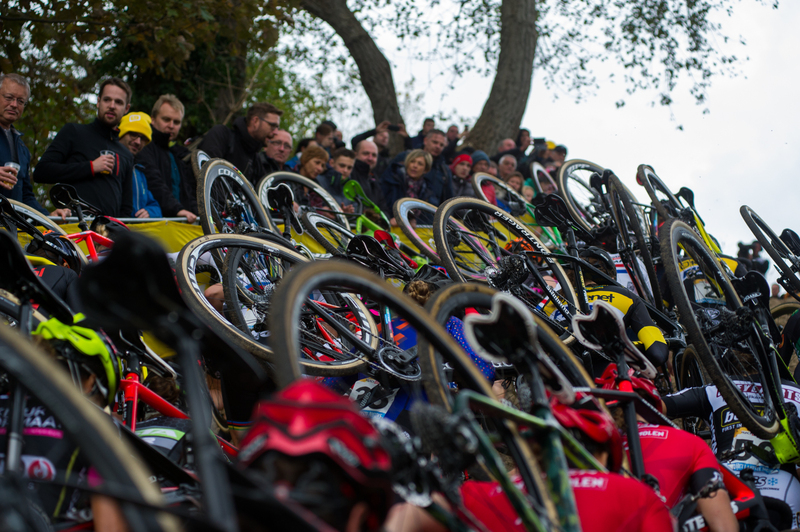 I was looking for some opportunities to get photos that were more in line with the “traditional” image of cyclocross. I know that’s a bit controversial around here, but I needed images with something other than bright sun and dust. 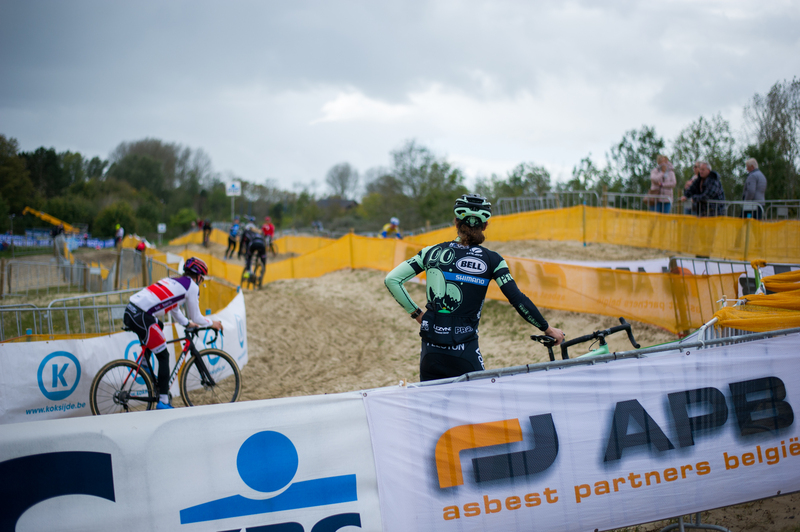 I found a very cheap ticket to Brussels for the weekend of Koksijde and reached out to former ROAD Magazine editor Andrew Juiliano who was living and racing in Europe for the entire CX season. Drew was staying at the Hof Ter Kammen in Oudenaarde for most of the season. It’s a B&B/guesthouse that caters to pro cyclists. 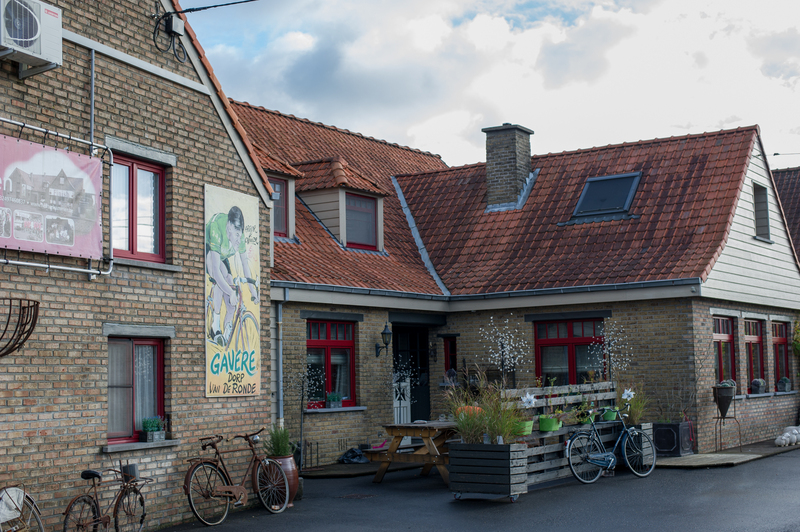 The large caricature on the building is a tribute to Arthur Decabooter, aka “El Toro,” Oudenaarde native and winner of the 1960 Ronde van Vlaanderen. I didn’t sleep on my overnight flight and I was determined to make it until bed time in an attempt to “reset” my internal clock. 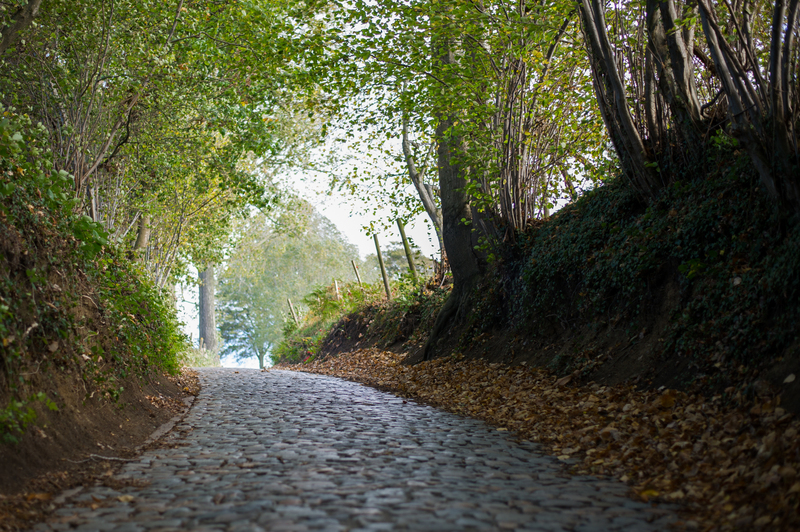 On arrival in Oudenaarde I had to check out the Koppenberg which is only a few kilometers from Hof Ter Kammen. The light when we got there was gorgeous. I didn’t make it all the way until bed time. 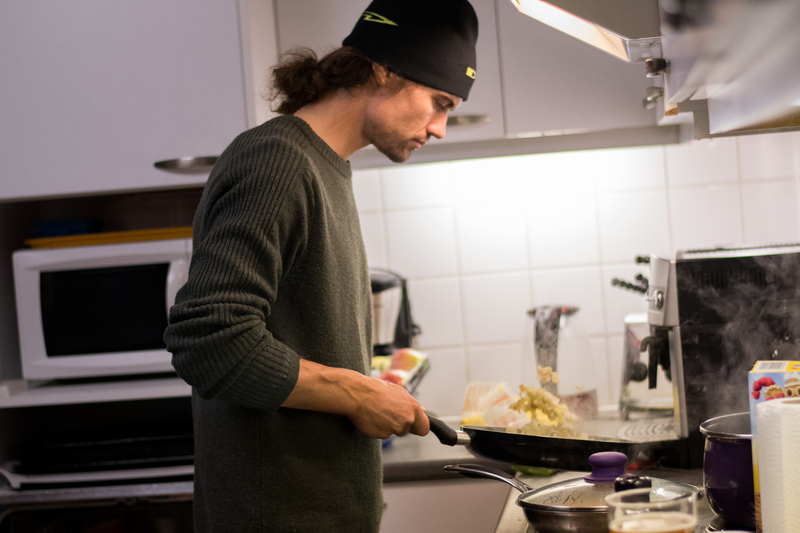 Drew’s apartment included a full kitchen and two bedrooms. Predictably, my first meal in Belgium was frites and mayo. After that I enjoyed delicious (and healthy) meals prepared by Drew and his partner Annick. On the nightstand in my bedroom was the winner’s trophy from the 2016 edition of Brabaanste-Pijl. (Petr Vakoc). 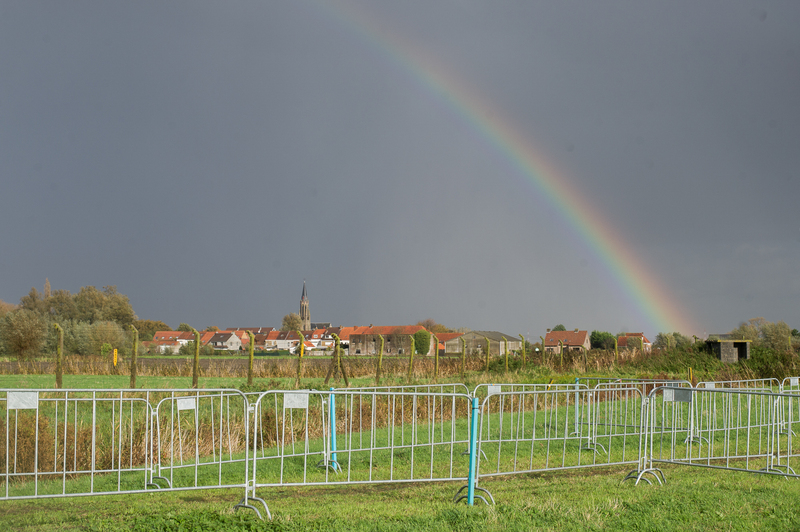 For years Christian, one of the proprietors of Hof Ter Kammen, was part of the group that owned Koppenberg Cross. They recently sold the race to another group but are still involved with organizing it. Hence the giant video screen in the driveway. 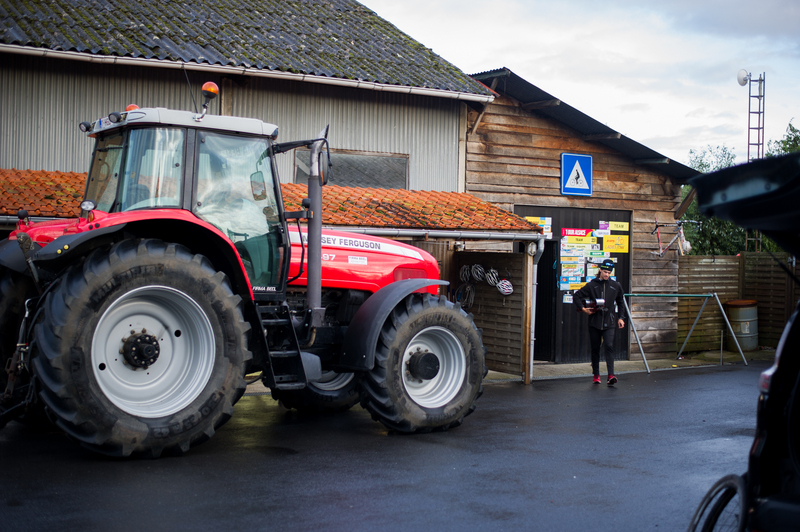 The facilities at Hof Ter Kammen include a large barn with lots of space for storing and working on bikes. Also, a big tractor. 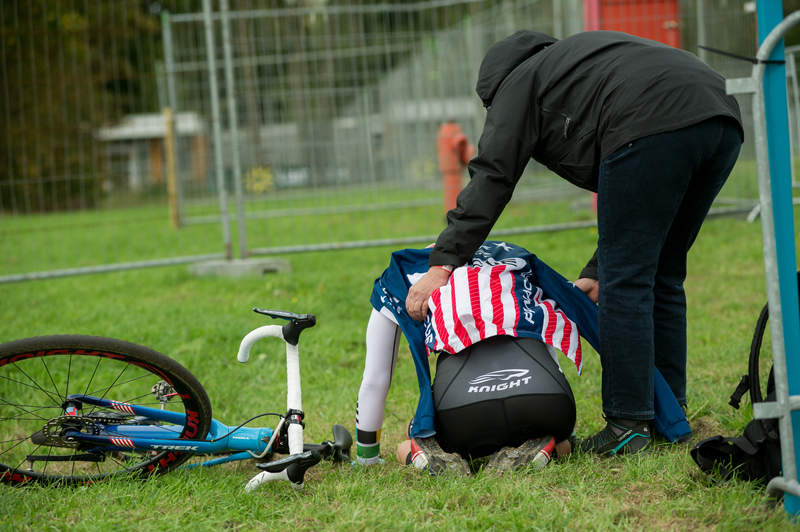 On Saturday before the World Cup I skipped shooting Boom in order to travel out to the course in Koksijde with Drew and his Idaho-based pit crew, Don and Mose. I really wanted to check out the course and try to get some sense of how difficult it would be to move around and what kind of areas were set aside for photographers. There were photo areas taped out inside the barriers but the entire course was edged with metal barriers and there were no breaks in them by the photo areas. 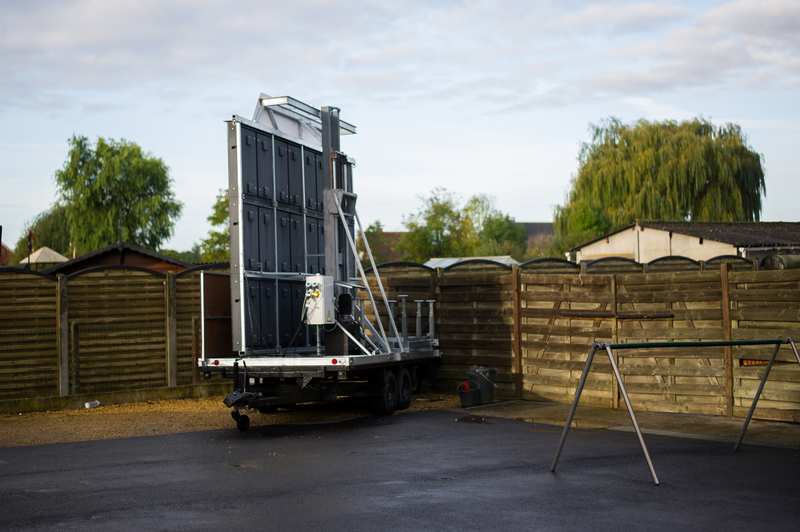 I wondered if I would have to climb the barriers each time I wanted to get in/out and how that was going to work with crowds all along them. Drew told me earlier that he was really good at riding in sand but I noticed he spent a lot of time staring at the long sand pits while he was checking out the course. I really under-packed for this trip. (And I actually forgot to pack my rain jacket.) It felt much colder than the forecast temperatures due to all the moisture in the air and the wind. It rained off and on while we were at the course and the wind was gusting. And just in time to pack the gear back into the car we got a drenching downpour. I ran into Jeremy Durrin while I was scouting the course and he said that he thought the sand was actually more difficult than previous years because it was more dry and the ruts were not well defined. It seemed to me that the high winds were probably offsetting the intermittent rain in terms of wetting down the sand. The night before the race, Christian demonstrates the proper technique for washing a bike. Shortly after I took this shot he handed the hose to Drew, “Now you’ve seen it. It’s your turn.” Drew had a great support network but he had to do a lot things himself that his competitors don’t ever have to get involved with. Katie Compton warms up on the rollers. The teams area was across the street from the course but very close, accessible and not restricted at all if you were on foot. I was somewhat surprised not to see more fans walking around but it may be that they save their autograph hunting for after the race. I was also on the lookout for the superfans who request photos of the riders and ask them to pose in particular ways, shouldering their bikes or removing their warm-up gear, etc. Sadly I didn’t spot any. 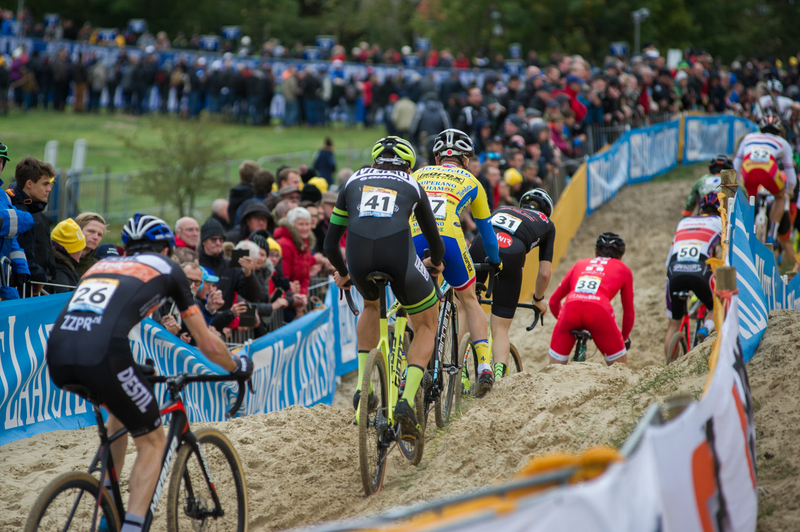 The first feature on the Koksijde course after the start is this steep sand run-up. For about 45 minutes or so before the start of the women’s elite race I camped out on this run-up trying to get shots for sponsor clients. As the start of the women’s race drew near I started walking to the start but I quickly realized that I wasn’t going to make it in time and that this spot was actually a good place to be on lap one. Very few races in the U.S. have a feature that forces everybody off their bike and even when they do I rarely get to see a whole field shouldering this way. Katie Compton dismounts in the sand. 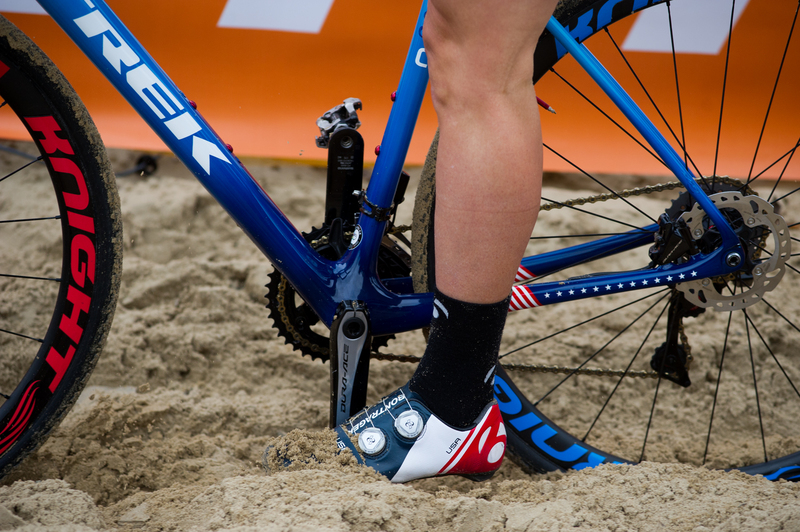 The sand at Koksijde is deep. And there’s a lot of it. This long section of sand had a photo area at one end. I should have walked out at the course crossing and made my way to it. But I hesitated. I wasn’t sure when the riders were coming through or whether walking on the course like that was ok with the credential I had. (It mostly was.) I ended up with some decent shots here so it was not a total waste. 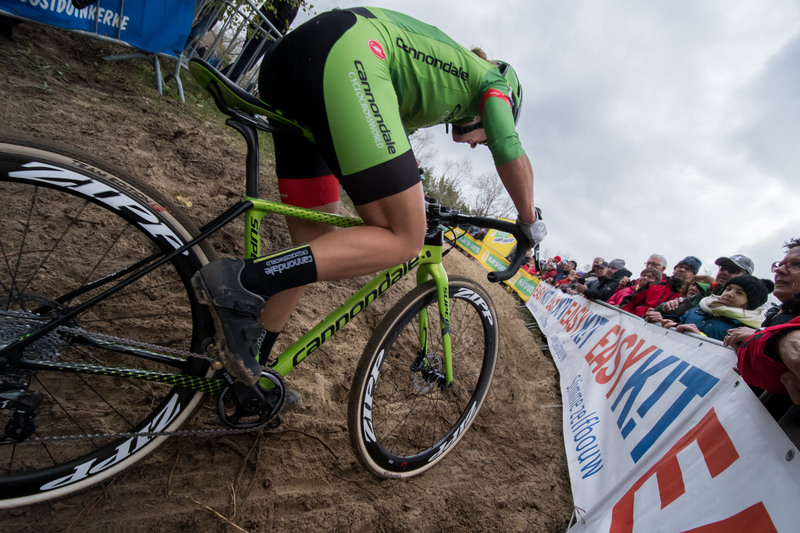 Sanne Cant chasing Kapthiens out of the large sand pits. When I got to this spot was when I confirmed that getting into any of the areas set aside for photographers was going to require climbing over the barriers. It wasn’t challenging physically but in some areas the crowd was really not happy about giving up their spot on the barriers, even for just a few seconds and even while while no riders were coming through. Le Petite Blaireau coming into the last sand pit. After climbing up this short steep section and making a sweeping left turn, this sand pit is flat and straight. It then turns right and drops down steeply. It was very popular with spectators, probably because you could run back and forth between this spot and the first steep run-up. Elle Anderson on the steep run-up. I tried to retrace my steps back the start/finish but that was a mistake. I should have either left a lap earlier or cut through close to the middle of the course. The issue was the course crossings. They got incredibly backed up toward the end of the race and I had put myself into a position where I would need to go through three of them to get to the finish. Katie Compton collapses post race. For the women’s last lap I was at the top of the first sand run-up and when Katie came by I could hear her gasping for air. I heard after the race that her allergies had triggered her asthma and that she was essentially riding the race while having an asthma attack. And she still finished in the top 10. I didn’t make it to the women’s finish in time to catch the winner but I was able to shoot a bit of the riders post-race and also the podium. I knew walking over that I was going to miss the finish but I kept heading that way partly because I figured I would get more shots of the women and partly to try to figure out a good route so that I could catch the men’s finish. 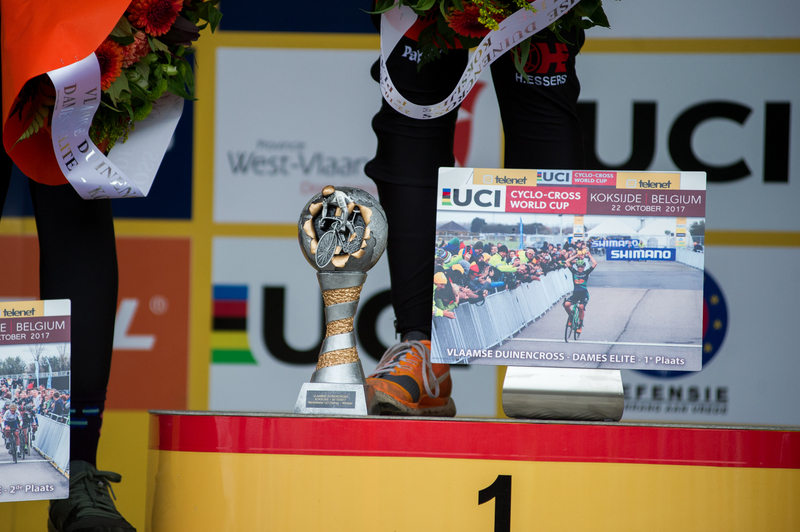 In addition to the traditional trophy and flowers the winners got trophies with a photo of the finish on it. Second and third place got similar trophies but with a photo from the start. 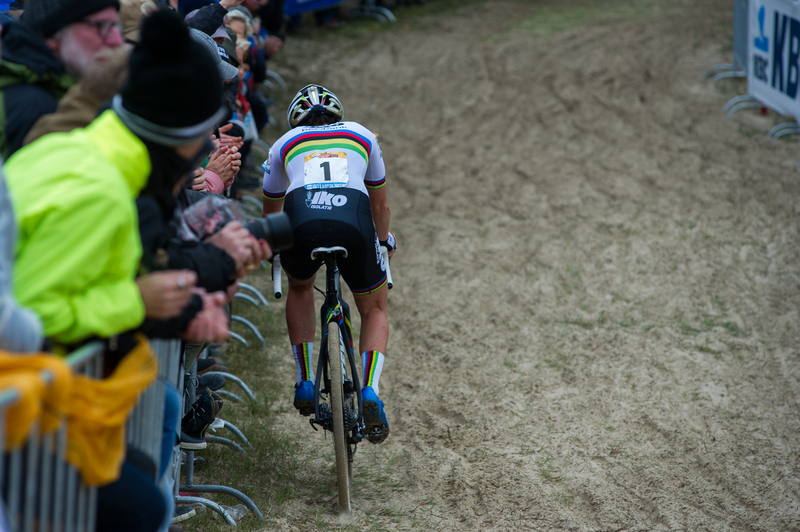 For the men’s race I decided to skip shooting the start line and head straight to the long, iconic sand pits. I figured that I would get better shots there when the field was not as strung out as it would be after a few laps. I might even get a few shots of Mathieu with other riders in the picture. I was pretty happy with my decision to head to the big sand pits first. Since the men’s race is a bit longer and I had a better sense of how to get around the course I decided to stay for two laps. I was able to get them coming and going, plus some wide-angle shots and even some shots of the fly-over in the distance. As I was on my to the next spot the leaders were already coming by again. I stopped to get a few shots but the spots along the fencing were being jealously guarded, forcing me to hold my camera over my head. I came away with a few usable shots and avoided “wasting” a lap. Two laps later and I am back at my favorite spot. There were crowds along the barriers but the proximity to the run-up meant that they were walking back and forth between the two, giving me an opportunity to get into the position I wanted. I stayed two laps here to make sure I got what I needed. Since I stayed two laps I was able to notice at this point that Jeremy and Drew had been pulled. That was a bummer but knowing that they were out of the race meant I could leave each spot a bit sooner. Vincent Baestens about to drop in. After shooting a lap on the big sand run-up I moved over to the big sand drop-in that’s closer to the middle of the course and should put me in good position to get to the finish. 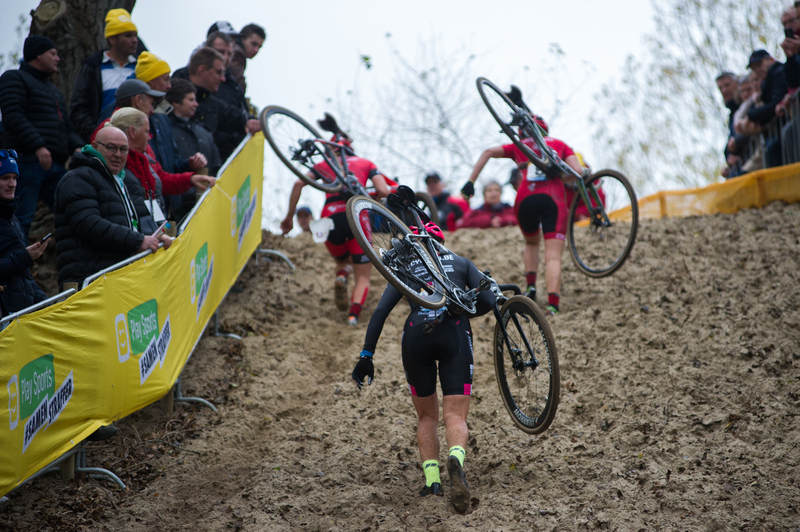 Also, this is a photogenic section of the course that I didn’t get a chance to shoot on during the women’s race. 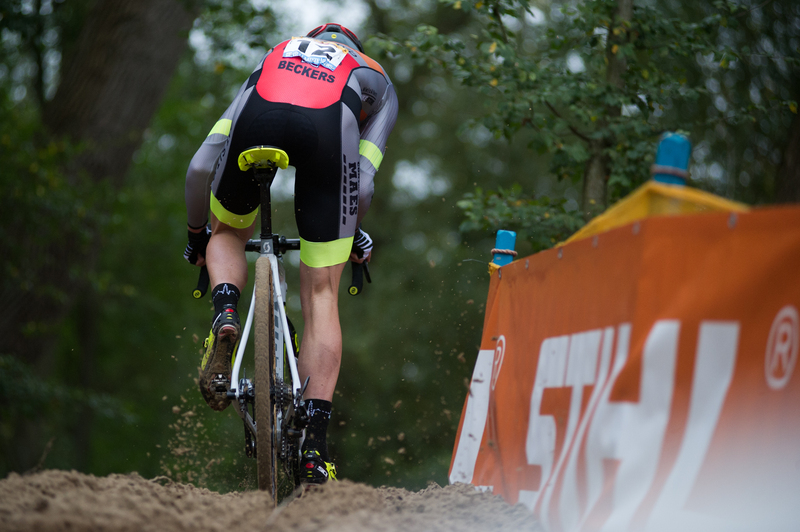 Toon Aerts cornering at the bottom of a big sand drop-in. There’s two laps to go at this point and I am in a good position to make it to the finish. Only two course crossings to navigate and, probably, plenty of time. On a typical American course this would not be an issue. I would hop the tape. But there just isn’t any tape on this course. It’s all metal barriers and they are all securely zip tied together. Also, I am being as conservative as possible and trying to keep a low profile. I don’t want to be the guy that’s standing in the middle of the course, blocking the TV shot, with my photo bib number in full view as Mathieu rounds a corner onto one the straight-aways. 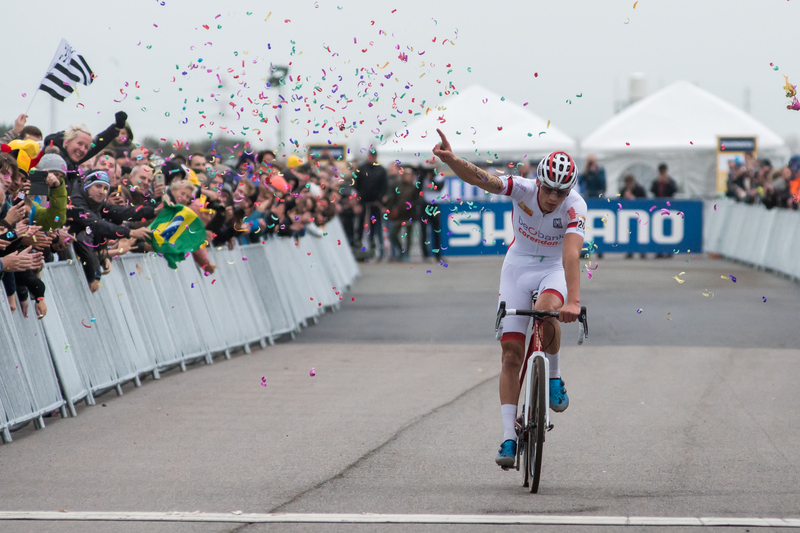 Mathieu van der Poel wins and the Dutch confetti cannon goes off. My yellow vest kept me from being in the front photo scrum but it didn’t matter as there was plenty of room to shoot over/around them. There were more fans around the teams area after the race. Mathieu’s bus was mobbed. 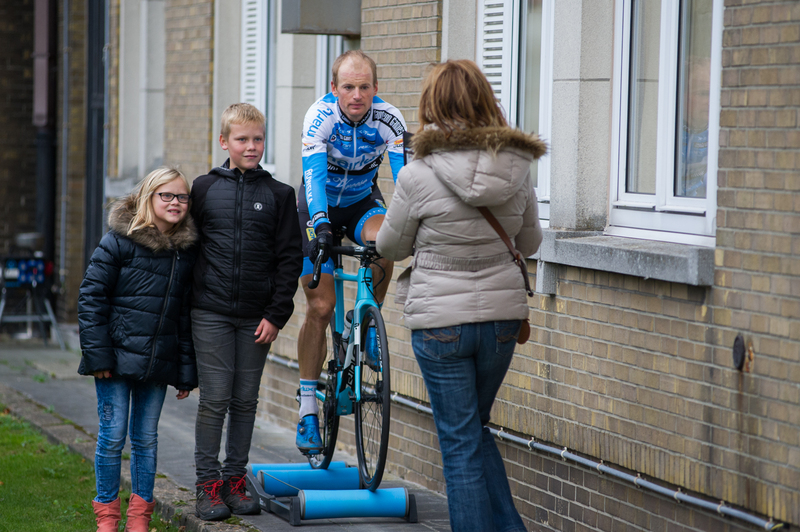 Here a family takes a photo with Kevin Pauwels as he cools down on the rollers. 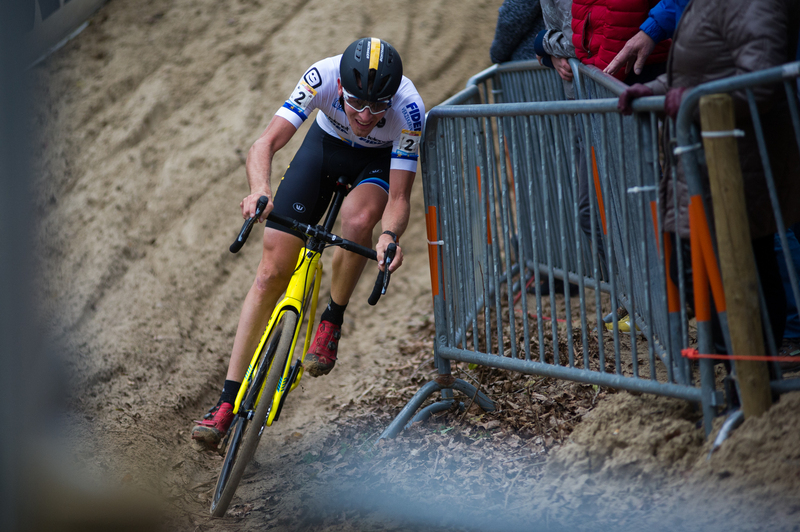 Wide Angle Podium members received a bonus Koksijde 2018 preview episode of Cyclocross Radio featuring Andrew Juiliano’s take on what to look for this weekend. If you are not yet a member CLICK HERE to join today and get access to this bonus episode plus lots more bonus content from all the Wide Angle Podium shows!